Fairwinds Golf Club was voted the “#1 Golf Course on Vancouver Island” in the 2013 BC’s Best – People’s Choice Awards by BCLiving.ca. Designed by renowned architect Les Furber, the course at Fairwinds Golf Club has established itself as a premier golf destination on Vancouver Island. The natural beauty of Fairwinds will change your state of mind… and possibly your state of play. If your golf game needs help, our instructors will help you reach a new level of confidence in your game. No matter what your skill level or swing needs are, we can help you on your journey to becoming a better golfer. After a round of golf, enjoy your favourite beverage and a well-deserved lunch at Fairwinds Bar & Grill. Overlooking the 9th green, this is where the stories are told and you can catch up on the world of golf. Enjoying the sun on our patio can erase any bad shots you may have had, while remembering the good ones. Just a short distance away, Schooner Cove Marina has become a preferred stop-over for boaters cruising the coast or exploring nearby Gulf Islands. Free club rentals and shuttle to and from the golf course are available to overnight moorage guests. 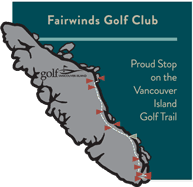 Fairwinds Golf Club is centrally located between Nanaimo and Parksville on the Nanoose Peninsula.